Our portfolio of industry-standard internet addresses are available in a 1 year lease. 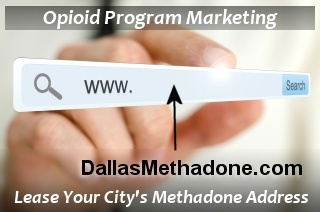 Leasing your city’s methadone address will deliver patients & visitors to your clinic’s existing website. Or, you have the option of moving your opioid program’s website to this new high profile address. Both options attract additional business to your clinic by reinforcing your clinic’s online exposure and enabling people to identify you more quickly as their local opioid treatment provider. Prospective patients searching for local opioid treatment typically type in their city + methadone as their root search phrase in Google, Yahoo, or Bing. For example: “Dallas methadone“. Our available internet addresses are exact matches of these highly used search phrases. Be the first to lease your city’s address – and take advantage of a highly intuitive marketing tool.